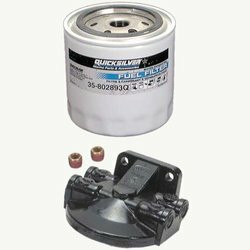 High volume replacement filter featuring 10 micron filtration with over 90% efficiency, flowing 120 gallons per hour while separating water from fuel. The internal epoxy coating protects against corrosion and the low pressure drop reduces fuel flow restriction helping to prevent vapor-locking and stalling. This filter contains 25% more media than comparable aftermarket filters, providing longer life and improved water separation. 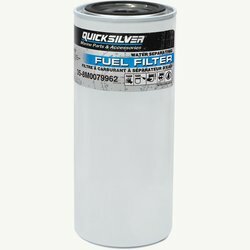 Water Separating Fuel Filter (25 Micron) used in both Outboard and Sterndrive/Inboard applications to keep fuel clean and free of water. 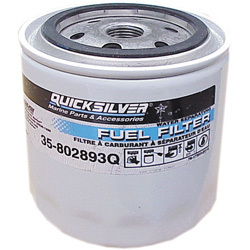 Kit consisting of vessel mounted head (without fittings) and Quicksilver’s High-Capacity Water Separating Fuel Filter. Brass fittings may be used with gas engines but stainless steel fittings (obtain locally) are required in diesel applications. Filter features 10 micron, 90% efficiency with a 120 gallon per hour flow rate. Water in the fuel system can cause poor engine performance and can even cause engine. Damage. 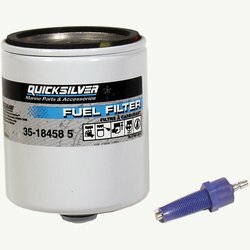 In addition to fuel additives, water separating fuel filters offer a great line of defense in keeping your fuel system free of water and other impurities.